Apple's AirPods are smart and weird wireless earbuds with a new W1 chip. Lightning EarPods and an adapter are the wired options now that the headphone jack is gone. Apple says that Lightning offers multiple uses where the old port did a single job, so that headphone jack is gone and it's being replaced with a fancy new wireless audio accessory and Lightning EarPods. Apple uses an new W1 chip to deliver consistent connectivity, quality audio and solid battery life. 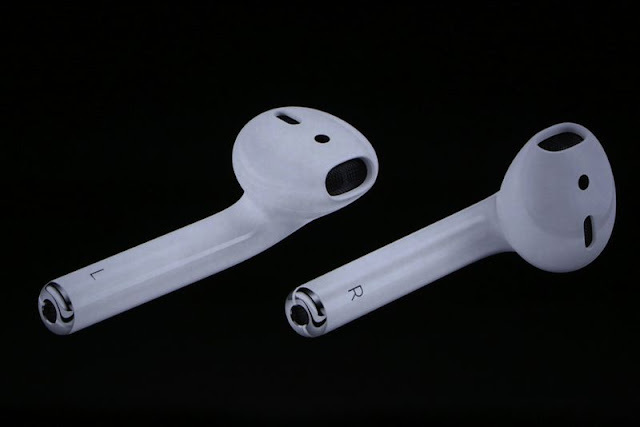 There are also built-in optical sensors and accelerometers so the AirPods will only play music when one of the buds in your ear. What's more, you can access Siri with a double tap thanks to on-board microphones. An additional accelerometer detects when your speaking so that the mics focus on your voice and filter out any ambient noise. Siri will also lend a hand with music controls so you don't have to fumble with swiping or touch gestures. In terms of battery life, expect 5 hours with an extra 24 hours via the included charging case. Setup is a breeze as well: All you have to do is open up the charging case with your iPhone nearby. Doing so automatically pairs the AirPods with all of the Apple device you have linked to your iCloud account. And yes, AirPods also work with the Apple Watch. What Say About This Smart And Ugly AirPods ?? Comment Bellow ! !